Just as getting married and having children during the Holocaust that would make grandchildren (who would then populate the Modern State of Israel) was the greatest of all vengeances the Jews could have exacted upon the Nazis, even so, our resting in God’s truth and in His Messiah; our living well; our rowing with the tides of life; our rest and joys at home amidst family and friends; our Bible in our hands; our peace making the LORD, not America, our true dwelling place; our obeying God rather than men; and our raising up children to do the same—this is the greatest and sweetest revenge against the fools that solicit our votes and claim that the nation and the world rise or fall depending upon what happens in a little election in one country at one point in time in all of history. LOL. As for more important matters, I requested prayer concerning this summer's Team Yeshua; and we continue to covet the same. Brother Ricky returned safely to Nepal, spent a fruitful two weeks on the ground there with Brother Bishnu, and he is now back up in Ladakh, making preparations for our eventual arrival. The team starts arriving here in NC on June 1st, and after a week of orientation and intense training, we will depart for South Asia on June 11th. I am really excited about some of the guest speakers who are coming in to help with the initial training, not the least of whom is a dear friend who has been working with Israeli backpackers in Argentina for nearly a decade. He and his wife have a great ministry going on down there in Bariloche; and from them, we have learned a lot. Concerning prayer specifics for this summer, please refer back to the previous post linked above. Lord willing, Team Yeshua Nepal will take shape for the Fall season in Kathmandu. Presently, we have one young lady who has met the requirements and has been accepted. We need at least one more young lady and a couple of young men who are willing to give of themselves from September 15-December 15 for the lost sheep of the House of Israel. If you know any solid young people who might be interested, please have them contact us ASAP (828-292-0045). Now, there is a story that never got told, so indulge me for some moments. Back on February 22nd, I hit the road. Seven weeks later, when I finally pulled back into my driveway, I had driven 6,300 miles across America AND 2,200 miles around the Modern State of Israel (keep in mind that Israel from its tip-top to its very bottom is not even 300 miles). It was a true missionary journey that involved preaching the Gospel "to the Jew first and also to the Greek" (Romans 1:16), giving out the Word of God, discipling and better equipping men already in ministry, supplying needs of the brethren in a foreign land, building up a ministry platform, and better preparing ourselves for outreach to Israeli backpackers this coming summer. We are very grateful for all the prayers that went up for us during this time. I actually drove out to California from North Carolina and left for Israel from there. The roundtrip tickets out of Los Angeles were really cheap; the gas was cheap; and the two brothers who came over to labor with us live in California. Thus, our team could travel together; and Brother Ricky could pick us up at the airport in Tel Aviv, having come from Nepal a week prior. On the way to California, I got to visit and fellowship with some dear supporters of FPGM; these were good times. One highlight of the road trip was preaching with Brother John Hedburg outside the Alamo in San Antonio, Texas. He delivered a powerful message, and I had the privilege of following-up, a warm-up per se for the opportunities that I knew would soon be presented in Israel. You can actually listen to this message here: Open-Air Preaching at the Alamo. My friends, there is power in the open-air preaching of the Gospel. Jesus preached in the open-air; the Apostles preached in the open-air; the prophets preached in the open-air. The Church should preach the Gospel in the open-air as the Lord gives the opportunity. For any young men who might be interested in lifting up the Gospel or a public testimony on the streets in these dark days, there is a great little manual by Gerald Sutek, a Baptist missionary to the Philippines, about the ethics, legality, mechanics, results, and biblical mandate of open-air preaching. I got my hands on this little book many years ago, and it was instrumental in my walk with the Lord. It's not very long, but it's a great read and can be accessed online HERE. And as Mr. Sutek points out: "There is a right way and a wrong way; those who choose the wrong way may gain immediate attention, but their reputation is short-lived." The lonely drive out to Los Angeles was actually pretty special. There was some sweet fellowship with the Lord in Carlsbad Caverns, in Guadalupe Mountains National Park, in that little boot of New Mexico on its southwest side, and in the hills along the Mexican border where Coronado, the Spanish conquistador, once walked. I crumbed a few Gospel tracts here and there and camped or picnicked in some nice spots. 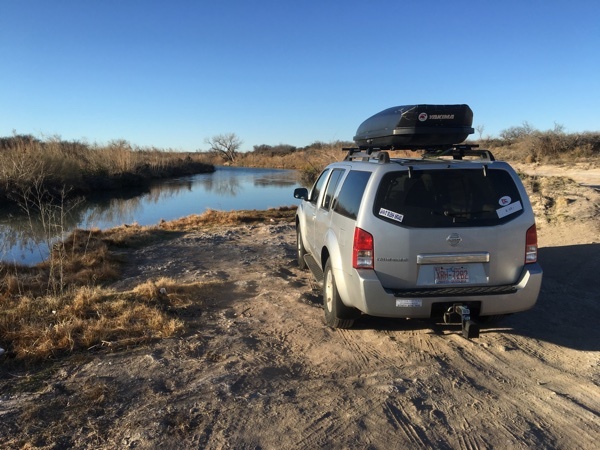 I enjoyed a great night's rest along this little rivulet somewhere in New Mexico. Finally, I rendezvoused with Brothers Ken Lightsey and Tim Mejia in LA, and we made the long trip via Moscow to Tel Aviv where Brother Ricky stood waiting in the terminal. The day after we arrived in the Israel, it was the weekly Sabbath, so the four of us walked along the seaside down to Jaffa. We found the location where Simon the Tanner's house supposedly once stood and mulled over how Peter saw his vision in Acts 10 on the rooftop which looked WEST out over the sea. The Gospel, he was told, would also be for the Gentiles. And, as history bears witness, it truly did barrel west from the Promised Land, west and literally over the sea. In those moments, I thought about how my ancestors were persecuted in Europe and then carried the Gospel to American shores; I thought about how the Gospel was in my family back in the days of Jamestown; how the Lord gave me a godly heritage and saved my grandparents and saved my parents, and saved me; I thought about how Jesus Christ of Nazareth changed my life and sent me back to the place where it all started. I thought about how I, a lowly Gentile, had the privilege of provoking Christ's brethren after the flesh unto jealousy by preaching the same Gospel to them that their ancestors once preached to mine. I thought about the Church, the glorious mystery of Jew and Gentile together as the Bride of Christ, and what a great honor it is to be a part of that Remnant Body and to be sent our by her with the power of the Holy Spirit and the Gospel to the ends of the earth. As we read some Scripture in a little Jaffa alleyway in front of a locked door, I was humbled. Shortly thereafter, we found a little Messianic congregation that Ricky had been invited to the previous week. The people there were praising God and dancing unto the Lord, literally shouting "Jesus is our God." No charismatic fleshly worship either, but genuine praise of Jewish believers unto the Messiah. There is Remnant of grace even now as it has been with the Jew since the New Testament Church began (Romans 11:5), since the days of Peter and the great sheet full of animals. It was a blessed Shabbat. 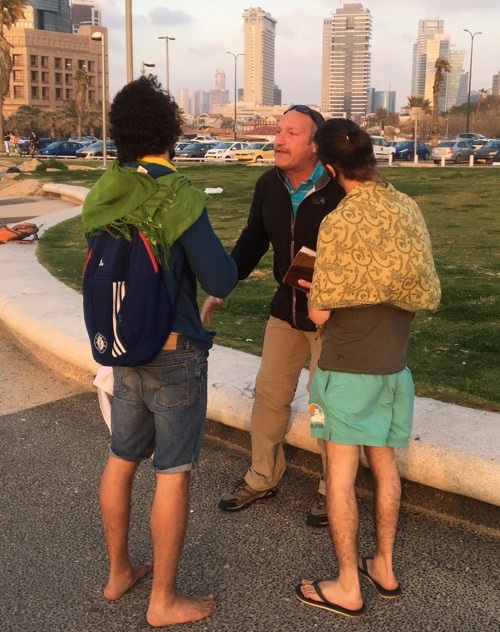 Brother Ken Lightsey engages some Israeli young men down on the Tel Aviv boardwalk. So things got off on a crazy note, and the next 3-4 weeks would prove a whirlwind from one end of the Modern State of Israel to the other and many places in between. As mentioned, we drove 2,200 miles around that little country, a nation-state only roughly the size of New Jersey. As we did last year, it was Eilat to Metula, the Meditteranean to the Dead Sea, and Dan to Beersheba. For the first twenty days, Brothers Ken Lightsey and Tim Meija were with us, and on the back side, my wife joined us for twelve days with a little overlap in between. 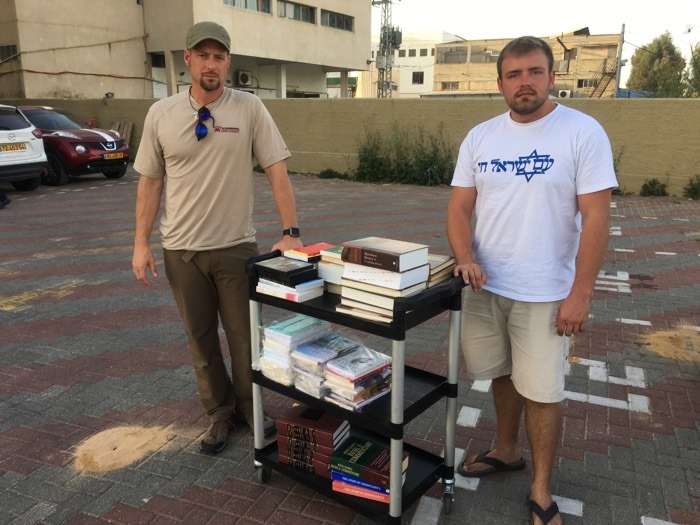 There is so much that could be written, one of the highlights being that we carried over a nice load of sound textbooks in church history, theology, and Bible commentary to help stock the student library at the Israel College of the Bible. Books like this are difficult to obtain in Israel, and our bringing them prove a huge blessing to believing Israelis who want to study the Bible and better equip themselves to reach their countrymen with the Good News of the Messiah. Praise God for those who helped contribute from their own libraries, praise God these got into the country with no problems in immigration, and praise God they were delivered. The Dean was so grateful saying, "Around here good Christian books are like gold." 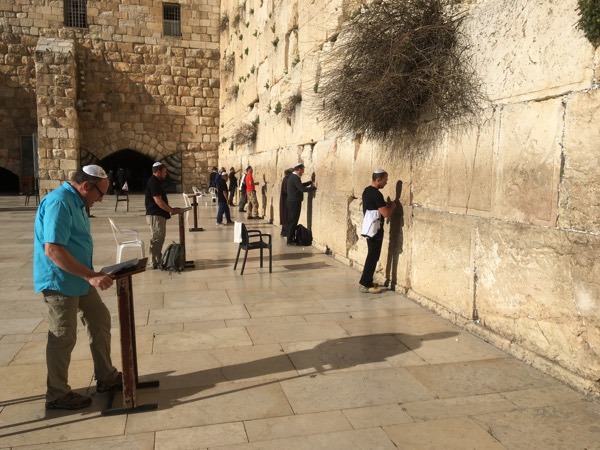 Ricky & Ken speak Scripture and Gospel truth at the Western Wall. Please pray for Adam, a young man from Boston who moved here to Tel Aviv three years ago. He asked many questions and was open. He couldn’t quite understand how a Bible-believing Christian is different from a Catholic. Brother Ken had the perfect response: A Catholic is to a follower of Yeshua as a Muslim is to a Jew. Then, he understood. 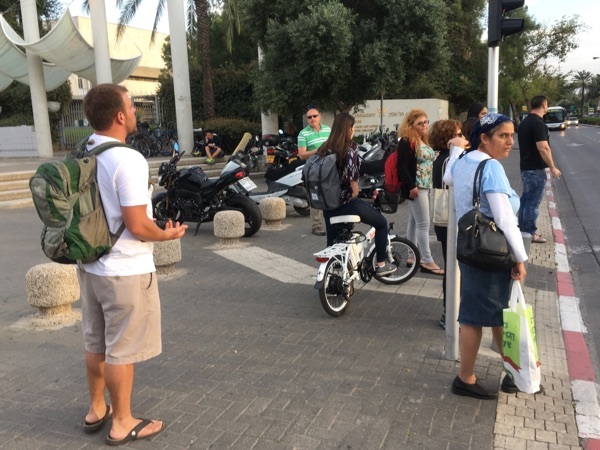 Ricky preaches at Tel Aviv University as students get out of class. 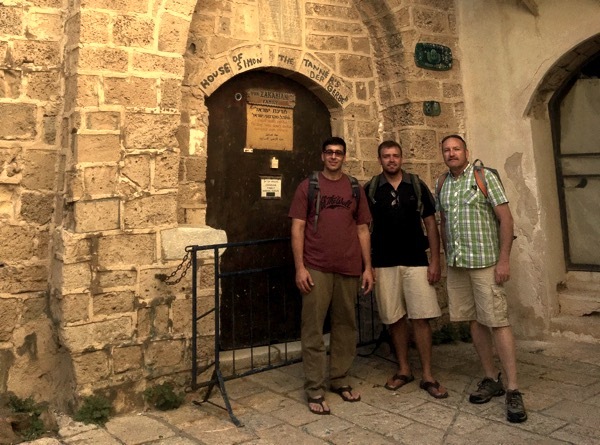 Sharing Messiah with these IDF tank commanders under the archway of an old Roman Aqueduct. They at least took some Hebrew tracts. 2 nights in a row in the tent like Abraham of old, not bad, not too bad. Except the Friend of God had no parking lots, no Mountain Hardwear, there was no such thing as rubber tramping, and there were certainly no Yellow Gas Stations with hairbender coffee for those crisp and cold mornings. Snacking on hummus, challah bread, and baked goodies around the tents in a small forest in the middle of the Negev Desert. It’s cold tonight. Today, we tracted and crumbed the very Jewish communities of Yeroham and Dimona where, I have been told, there is no Messianic light. I was reminded of our clandestine tracting distros in Ladakh and Tibet. Praying the Word of the Lord put out will not return void. No question open-air preaching would have gotten us run out of these places, perhaps with violence. There are always other efficacious ways to get the Truth out. As for these remote but very clean and upscale towns, it was impressive to see how the Jewish people back in their land can make the barren desert literally bloom. Tomorrow, we head through Beersheva and the West Bank back to Jerusalem. We’ll see what the Lord has in store. For now, I’ll enjoy the starlight and the desert silence. Goodnight from Israel. Please pray for Roy. He took at New Testament after a long conversation about the things of God and Messiah. I knew my friend in Jerusalem recommended this little coffee shop in the Negev for a reason. It was good to come back to one of the towns we crumbed last night and have a meaningful witness this morning. Now, it’s on to Beersheva, Abraham’s old home. We popped into a little cafe in the Arab Quarter of the Old City and sat down. I thought I heard the Nepali language, no way, not in Jerusalem. Sure enough, there was a whole table of Nepalis, people who moved here to work, mostly caregiver work and manual labor. Praise God Ricky has some of our Nepali Gospel tracts on him. They were shocked to hear us greet them in their language. Pray that God’s Word gone out in the Nepali language in the heart of Old Jerusalem does not return void. There’s a rabbi standing out here on Yaffa Road in full penguin garb playing a guitar and trying to sing the Eagles’ Hotel California. Tip cup is in plain view. Is this real? I’m standing in the modern Jewish settlement of Beth-El looking across the small valley at the hilltop site of the biblical Bethel (now an Arab settlement in the West Bank), the place where Jeroboam erected a golden calf for the people of the Northern Kingdom to worship so they wouldn’t go down to Jerusalem. Amazing, it’s hazy, but I can also see the Mount of Olives and just on the other side would have been the Temple. That calf was erected almost within site on a clear day of Solomon’s Temple. Wicked. P.S. Tourists don’t normally come up here. We had a long conversation with an Orthodox man in a cafe just now. I wish I had a recording of the whole conversation. His only objection to Jesus being Messiah was “The rabbis say He isn’t.” It was a very long back-and-forth, and I could say so much about it; but two striking statements suffice to make a point: First he said, “If Jesus comes back, we’ll kill Him again.” Yes, the old man actually said that! The same spirit of the Jewish people crying, “Crucify Him!” two thousand years ago is very much alive in Judaism today. The Scripture is fulfilled, “The stone which the builders refused is become the head stone of the corner” (Psalm 118:22). Later, he said: “If Jesus IS the Messiah and we are wrong then we will say sorry and He will be King.” This will happen one day. But not before the Great Tribulation spoken of in the Scripture wherein 2/3 of the Jewish people in Israel will die by the sword of Antichrist. My time here in Israel has abundantly confirmed what I believe about eschatology, dispensational premillennialism, and pretribulational rapture eschatology. God is setting all things in order for the Second Coming of Christ. Trim your wicks and get ready! Or else it will be too late (Matthew 25:1-13). I am also so grateful for all of the Jewish people that are a part of the Church. You may be rejected by your fellow Jews but you do honor God greatly by holding fast the faith of your father, Abraham. I thank God for the Jews and I will continue to call them and the whole world to repentance until our Messiah returns. Funny, after a whole day in what have been called dangerous areas in the West Bank, the only threat we received was from a Jewish young man after he heard us speaking about Yeshua. Another man called me and my wife “Jew killers.” God forbid someone refer to Jews as “Christ killers” (something Simon Peter, a Jew himself, did in Acts 3:14-15), but I guess it’s perfectly fine for an Orthodox Jew to call a Gentile and his family “Jew Killers.” Sheer profundity . . . Still, it was a great day that involved a long conversation with a very Orthodox man in a military canteen, and everyone inside heard as we spoke of Yeshua Ha’Messiach. And, by the way, no one killed Christ Jesus. He laid down His life for Jew, Gentile, and for me (John 10:17-18). Hallelujah. The tourists don't usually come here. The hill in the background is the old Hill of Samaria where the Northern Kingdom had its capital. It has been a wonderful Resurrection Sunday here in Jerusalem. Whilst it was still dark, we walked across the Old City, crumbing with some Hebrew and Arabic tracts, and then landed at the Garden Tomb, just outside the Damascus Gate, as the sun was coming up. What followed was an awesome sunrise service, standing room only. There were Evangelical Jewish, Arab, and Gentile believers from many places gathered to praise the Risen Saviour, a sneak peek of heaven it seemed. The Gospel was preached very plainly and with power. And the best part was that the singing, preaching, and the name of Jesus bellowed out across that Muslim neighborhood where normally it is the hellish demonic calls to so-called prayer. We were much encouraged and much blessed. Later, Ricky and I preached about the Risen Messiah outside the Jaffa Gate, reading from the Messianic Psalms. I even sang a few Easter hymns. One Messianic woman came by and was so encouraged. Notwithstanding, we drew the ire of a few Pharisees, a Zealot, and a Judaizer. Yes, those New Testament types are still very much alive and well; and their self-righteousnesses, hypocrisies, and blindnesses haven’t changed. The best responses were the same ones Jesus and Paul gave. It was all very interesting. Still, the Word was preached in a very difficult place and some did take tracts. This afternoon, we enjoyed some sweet fellowship with a couple Jewish brothers in Christ; and the day concluded on the rooftops with the gold on the Dome of the Rock glinting in the setting sun. Toward the evening of the day our Lord arose, He appeared to two men walking to Emmaus “and beginning at Moses and all the prophets, he expounded unto them in all the scriptures the things concerning himself” (Luke 24:27). Toward the evening of this Resurrection Day, we had the great privilege of doing the same for nearly an hour with a young Jewish man from Brooklyn, New York. Please pray for Jonathan; he seemed open and took a tract. Funny, the Church of the Holy Sepulchre wasn’t a circus today; it was pretty quiet. You see, the Catholics don’t care much about Sunday morning. It’s all about “Good Friday” and a weak and maimed Jesus strung out on a Roman cross. Friday, all the pilgrims were squeezing in to kiss rocks, icons, and light candles. But today, it was mostly quiet. Catholic Jesus ain’t Bible Jesus. He ain’t Yeshua Ha’Messiach. You see, our LORD is risen. The cross is empty; the tomb is empty. He is alive, and He is coming back for His Church very very soon. Please make it stop. The Muslim calls to prayer are reverberating throughout Hebron from multiple minarets at once. Sounds like a chorus of demons from the pits of hell. Ahh, make it stop! . . .It’s an eerie ghost town down here in this Jewish neighborhood near the Macpelah Cave. That’s a Hebrew New Testament that got strategically placed on a bookshelf above where Abraham and Sarah are buried inside the oldest religious monument in the world. When you walk inside, you walk on Herodian floors. On this street, we prayed over two IDF soldiers and were able to give testimony of Yeshua. They both took tracts. And, needless to say, the Tomb of the Patriarchs got crumbed. As I drive out, there is a sketchy kilometer of road that goes into the Arab-occupied Hebron. From down here in this tiny patch of Jewish settlement, the Muslims have the high ground staring down from all directions. It’s weird, I’m posting to Facebook surrounded by thousands of people who want to kill me and every Jew living here. Wicked. Well I better drive out of here. The first kilometer is the worst. What a great way to spend our last day in Israel. During an earlier visit to the Tomb of the Patriarchs, this IDF soldier was very open to the Gospel. I was trying to sleep on a bench here in the Moscow Airport, and a young Russian man named Phillip walked up and wanted to practice his English. I wasn’t exactly in the mood for this, but it was an opportunity to be a witness. He was a nice young man and took a Gospel tract. Please pray for him. 6 more hours here, then a 13-hour flight home. I have a 15-page paper that I have to finish by Friday and keep thinking I should take the opportunity to work on it, don’t even have a topic yet. Nah, I’ll wait until the night before it’s due. That’s been my practice going all the way back to seminary, college, and high school. My best work has always been when under pressure. Why am I even talking about this? Bored in Moscow. This Gospel of John is printed in memory of Earl Taylor Green who was born on December 19, 1928 and went home to be with the Lord Jesus Christ on December 24, 2012. He was a lover of God's Word, the Bible, and a lover of the Nepali people. God bless Nepal! These came off the presses several weeks ago; and this new batch will help supply believers that Brother Bishnu supports to preach the Gospel and plant churches in remote village districts. I'm reminded of Psalm 68:11: "The Lord gave the word: great was the company of those that published it." Below, are some recent recaps from Brother Bishnu, our national partner in Nepal, that describe how the previous supply was exhausted. In one outing, 30,000 pieces of Project Jagerna Gospel literature were supplied to local churches for evangelism in the remote villages. Tons of Gospel tracts go out at a trade show near Buddha's birthplace. We would like to thank you very much for your continuous prayers. The Lord gave us safe trip and a wonderful ministry among the youths of the mid western part of the country. There were more than 300 youths from 25 different churches, gathered from Dang to Dhangadhi. I asked them what the Gospel was but they could not give answer. So I preached them the true Gospel and train them to preach the same. It was really sad that they did not know the true Gospel, but was a great time to give preach them the true gospel and encourage them to share the Power of God unto salvation. I spoke for about 4 hours and supplied them with 30,000 tracts. Now they are using it in their own areas. Please pray for these youths and their lives that the Lord uses them mightily. Also the Lord has given us two more church planters in the very remote mountains of Jajarkot. Kar Singh and Bhaktajan are two young brothers laboring in new areas of the district of Jajarkot. And we want to encourage these brothers with prayers and financial help. Please pray with us for these brothers. Bishnu trains Christian youth in evangelism in Dhanghadi. We would like to prase God for His mercy upon our recent ministry in Nepal’s Far West. God was really with us and He did great works there during our ministry. Thank you very much for your continuous prayers and support. Your were with us there through prayer. And indeed, God answered your prayers. Bajhang is one of the most remote districts in Nepal, bordered by Tibet to the north. The Lord provided twelve of us a good bus to Chainpur, the district headquarters of Bajhang. We have proclaimed the Gospel in many villages of Bajhang on former trips, but we had never been so far north. So, we were excited and had been praying for the trip, that the Lord would prepare the hearts of the people we were going to meet. Ten youths, including two girls and a pastor from Dhangadhi were with me on that long bus ride in the high mountains. It took 11 hours for us to get there, and a good rain welcomed us. The day before arrived, there had been a deadly flood that killed a girl and damaged the road. But, they were clearing the road, and we got through. I felt sad that 9 of our team members could not eat any food on the way due to travel sickness. Finally, we arrived at a village church that welcomed us for the whole time. We had brought our own rice, beans, and vegetables from Dhangadhi. We met a former pastor of the church that evening and talked about our plans. I asked him to show us the unreached villages that had never heard the Gospel before. To my surprise, he told me that there were no villages that were unreached. We prayed and I started my training on evangelism with the team. I completed the training in three days, every morning and every evening. The next day, we divided the team and planned to divide it further in the villages. We went south, and another team went north. Sure enough, we met so many people in the surrounding villages who had never heard the name Jesus. Many asked us to preach, many invited us in for food. We reached many villages, going house to house and distributing 5000 pieces of Gospel literature in just five days. I was so happy on the first day when one man asked for a Bible. He asked me, “What is it?” I replied, “It’s a message from the Bible.” He said, “You only give message, but not the Bible.” I said, “Do you want a Bible? Will you read it?” He replied, “Yes, I want a Bible and of course I’ll read it.” Then, I gave him a brand new Bible, the only one I had grabbed while leaving my house. I had in my heart that if someone would ask for a Bible, then I would give it to him/her. He was so happy that he almost cried to receive the Word of God. I told the former pastor that evening that we were very happy to preach the Gospel to those villagers who had never heard the Gospel before, but we were sad that the next village had not been reached in 25 years! You see, the church board says the church was established 25 years ago. I don’t understand things like this. And my heart was saying not to follow that man’s information, but to instead go north. The day following, we did go north toward the snowy mountains. I always believe that the northern villages are not reached. So, we went preaching to the nations and to the policemen. Our strategy was to reach every soul we met. We were hungry and thirsty, and it was about to rain. We prayed and the Lord took the rain away to another village while we stood by a cowshed. And, the Lord showed us some wild berries. God really took care of us. After climbing almost 2,500 feet, we arrived in a village named Seragaun. Our team started singing some Gospel songs, and people gathered. One old man, seeing our hungry faces, offered us some rice and beans; and he offered a place to cook and eat. The Lord was so good to us. We left some of our team members to cook the food, and the rest of the team headed even farther north to redeem the time. Then, the Lord brought us to a shopkeeper. I preached the Gospel to Mr. Dabal Bahadur Kunwar while other brothers went up to reach the houses on top of the mountain. While I was preaching to him, he was crying and very serious about the Gospel. I encouraged him to forsake all the idols and sins to really follow the Lord. I told him that he could not worship the idols and also trust in the Lord. And I challanged him, “Today is the day of salvation.” He said that I believe in the Lord from today. We just praised God for Dabal. As we prayed, the Lord had prepared many hearts. At the dusk, Bhim Bahadur Bohara was ready to enter the Kingdom. It was dark when we parted from this brother and we hiked down at night for 2 hours. On the way back, I met some brothers in two towns. I was tired, and my bag was heavy because of the potatoes I brought from Bajhang. I arrived at Butwal at 3:25pm. There were no buses going to Kathmandu. I had two options: wait for 5 hours and take a night bus OR fly out of Bhairahawa. In one section of the road, they are widening the road and there were many landslides blocking the road for 5-10 hours everyday. So I thought to fly. I called Yeti airlines about the ticket. The flight was scheduled for 5pm. I had to travel 25km. I asked them if I could pay next morning after I arrive. They accepted my request and asked me to run to the airport. I asked the local bus how long it would take to get to Bhairahawa. They did not answer. Then I asked the taxi. It was Rs. 1200. Way too expensive for me. Then the Lord provided an empty taxi going to where I should go; it was only 100 rupees. Praise the Lord! The airline called me when I was 3km from the airport, “Do you want us to issue the ticket?” I replied that I was almost there. So they issued the non-refundable ticket. I literally ran into the airport. They again called me, “Are you still not checked in?” I said, “I’ll be there in two minutes.” The airline staff and I opened the two doors of the waiting room together. As I entered the room, it was announced for us to board. Praise the Lord. He had mercy on my travel. And, I paid for the ticket next morning. God is always good. Once again, thank you very much for your prayers. There are still many villages to reach. Please pray that the Lord of harvest would send His laborers into His field. We need more laborers. This man asked for a new Bible, and he got one. 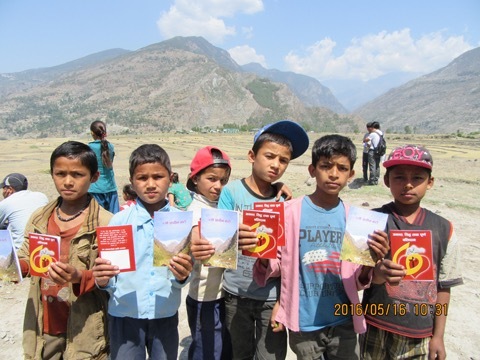 Village children receive the Gospel in Bajhang District. Your prayers and support for FPGM help us undergird and partner with local brethren like Brother Bishnu and those he trains and sends out. Presently, that brother is personally supporting four Nepali missionaries each month, right from his own pocket out of monies he earns from his bookstore. Two of these were sent out by him to the remote Jajarkhot District to preach and plant churches. Another brother is involved with a church plant down in Kapilbustu District; and the fourth is supported in the work of evangelism and church planting in the remote Ramechhap District, one of those areas hit pretty hard by the earthquake last year. Pray for Bajhang, a true end of the earth. Speaking of the earthquake, Full Proof Gospel Ministries collected $32,000 for Nepal Earthquake Relief last year. Except for about $200, that fund has pretty much been exhausted. The last of it went to help complete rebuilding of a brother's village home near Gorkha, one of my oldest and best friends in Nepal, my first language teacher. Ricky hand-delivered the funds a couple weeks ago. Daya Ram wrote to me shortly thereafter as construction neared completion: "Special thanks to my Bhai (i.e. younger brother) and FPGM. Many people have come to see our house because I have made it with earthquake resilience. You can see the belt on the wall." He included a few photos of the work, and my heart was glad. We have so much to be thankful for here in America, and we take it all for granted. That's what Solomon did, and his heart soon went after other gods. We better wake up, my friends. The actions and attitudes of our poor and persecuted Christian brethren around the world stand in judgment against us. Construction is almost complete, earthquake belt and all. It was also a blessing to help Brother Bishnu's family move to a new home, something they desperately needed, especially following the quake. The new place provides adequate room for their family and was constructed after the earthquake. It also means I have a prophet's quarters in which I can crash when passing through :) Brother Bishnu gave so much of his own time and effort, and dug deep into his own pockets this past year to help us reach out to believers in the hardest-hit areas and to distribute supplies and the Word of God well off the main roads. So many copies of the Scriptures in the Nepali language went into the hands of the lost. It was a blessing to extend help to them in a way that would insure the Gospel continues to go out in the days ahead. Thanks to all who gave last year. Bishnu shared with me that earlier this year, he used some of the funds to purchase water pipe for a village area in Shading. The earthquake had destroyed a lot of the village water systems in this area. One of the village elders was so grateful and said, "My friend, this water piping is like milk from a mother's breast to her thirsty baby. Thank you." Of course, no earthquake relief without Gospel preach, so many likewise heard the Word. Christian Parks was on of our Team Yeshua members last summer in Ladakh; and he later returned to South Asia to intern with FPGM in Nepal for another eight months. He returned home to the States on May 16. Ricky had these words to say: "Christian has been a great help in the work over here. It has been very encouraging to watch him grow and be used of the Lord. It is rare to meet someone that is so diligent in sharing the Gospel (as opposed to a mere youthful zeal). He is now heading back to the states to seek the Lord about his next step in life. My prayer is that he will not cease to publish the glorious Gospel among the nations and that he finds his way back to South Asia soon. The laborers truly are scarce and the work is overwhelming! I gave him some of our pictures to put on his computer before he left, and I was pretty encouraged looking back on all we were able to accomplish. I can say with a clean conscience that by the grace of God we truly glorified the Lord on all of our journeys. All that remains of his presence here in my Kathmandu flat is a neatly made bed and his hollowed-out shelf. I'll miss you brother! God speed." Christian Parks bids farewell to Nepal, for now . . .
Daniel Middleton shares Christ with a man, prays over him, and buys him a coffee at a Dunkin Donuts. Daniel, Eric, and Jason truly earned and deserved their brown belts. And, though the skill and proficiency demonstrated was well beyond black belt level according to most dojo standards, we endeavor to maintain true to the high standards upon which Catawba Valley Martial Arts was founded. I am very grateful for these guys, for all their hard work and dedication, for their loyalty and accountability, and for their friendship. In many ways, my students are my teachers. Now, we get to ride back across the country together, preach the Gospel together in Las Vegas, go to the Grand Canyon, and reminisce about this experience along the open road. Last night, as we drove to Vegas to crash at some friends' house, I observed something at a Dunkin Donuts that spoke more to the character of my students than anything I had observed in any kata, any technique, or any grueling aspect of their brown belt test. In the last picture, I turned to see Daniel buy a stranger a cup of coffee, share with him the Gospel of Jesus Christ, and then put his arm around him to pray with him that God would meet his needs. Amen. Later, we would preach with boldness down on the Strip in Las Vegas. It was wicked down there, but each of these brothers stepped up to the plate, and the Word of God went forth. Ricky, too, was bold. And, as I preached without mincing words, there was no fear. I was surrounded by brothers who could and would protect me. At the Grand Canyon, I was amazed by how many opportunities we had to share Messiah with lost sheep from the House of Israel. Anyway, praise God for platforms and talents we can use to point others to faith in Jesus Christ. If you have them, my friends, use them. When you go out in whatever you do, shod your feet with the Gospel. I've also been continuing my exegetical study of the Book of Revelation at New Testament Christian Fellowship here in North Carolina as Sundays are free to do so. This adventure in the Word of God began back on January 13, 2013, and is now up to 84 messages. Just the other day, I got through the first ten verses of chapter thirteen. All these sermons are available on Full Proof's STUDIES IN REVELATION PODCAST; you can also subscribe on iTunes. Beware though: words ain't minced; truth ain't dissimulated; and there ain't no apology for what the Word of God has to say :) He that has an ear, let him hear; and I pray these are a blessing. We've also been helping out on an interim basis with the preaching at Living Word Baptist Church in Creedmoor, NC--my original sending church. Pastor Mike Vaughn, a good brother and a solid shepherd, has been dealing with some major health issues that have had him hospitalized. It's been an honor for me and Brother Ricky to step in and fill this brother's pulpit, to give back to a local church body that has been so faithful to support this work back to its inception in 2004. Please pray for Pastor Mike Vaughn and Living Word Baptist Church during these trying times. I am sad to leave the brothers and sisters of this small fellowship (ten of which are widows) and go over the big pond to India. But, I praise God for some preachers I have been able to round up to help, not the least of which include a couple of my martial arts students who sense a call to ministry and needs opportunities like this to grow in that call. Here's a message I preached to the brethren at Living Word back on May 1st - an encouraging word from Psalm 11 to the Remnant Body who wonder what to do when the foundations be destroyed: IF THE FOUNDATIONS BE DESTROYED? (PSALM 11). As always, we labor without benefit of furlough; and we can't complain. Well, Team Yeshua 2016 will start arriving here in North Carolina this week. Orientation starts next week, and Lord willing, we all depart for South Asia on June 11th. 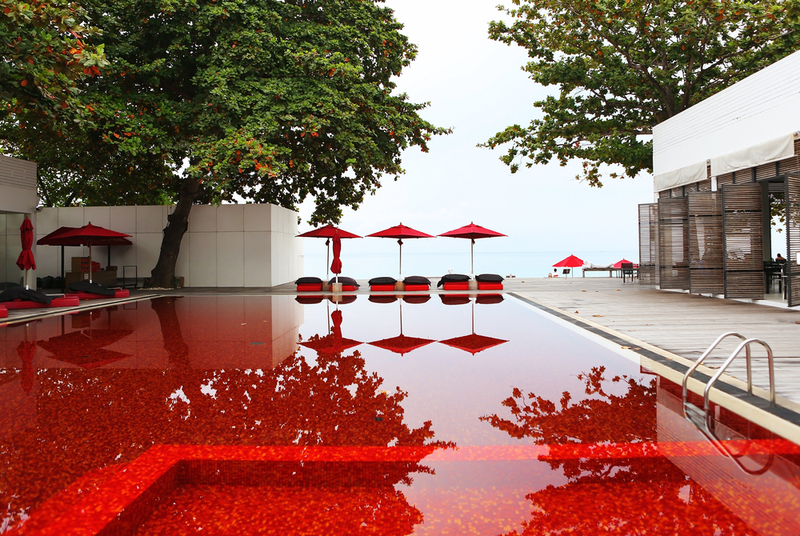 There is so much to do and so little time in which to do it. But, God always shakes things out. What is worrisome now will be cause for a chuckle a few weeks from now. The tides of ministry: they come in and they go out. Let's occupy until He comes. Maranatha.